It may have been 20 years since Chuck Prophet last played a venue in Birmingham but his blistering performance this evening set out to relieve two decades of frustration for his dedicated fans and captivate a legion of new followers. Right from the off, Chuck and his three piece Mission Express band was determine to rock the Hare and Hounds to its historic foundations and after overcoming the hiccup of a little technical difficulty straight after the opening Townes Van Zandt cover ‘Dollar Bill Blues’, the next two hours was pure raucous bliss. Only after the barnstorming encore medley of Chuck Berry’s ‘Tulane’ and Dr Feelgood’s ‘She Does It Right’ , a Wilko Johnson tribute, which sandwiched Chuck’s new song ‘I Call Your Name’, were those present able to get their breath back. It probably gives Chuck a little injustice to recount three covers in the opening paragraph of this review as he is the composer of many fine songs over the years and there is an excellent album released last year which contained several memorable songs on the evening. 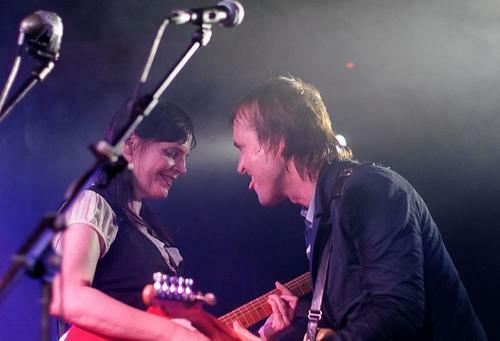 TEMPLE BEAUTIFUL was my introduction to the world of Chuck Prophet and it was with the quality title track that he really started to engage with the healthily turned out midweek Birmingham audience. ‘Who Shot John’ and ‘The Left Hand and Right Hand’ also represented this album in the set list, although it was two songs based on San Francisco iconic figures that resonated most with me. As a baseball fan, I have been intrigued with Chuck’s ode to the legend duly named in ‘Willie Mays is up at Bat’ and the fantastic live version played tonight easily rivalled some of his back catalogue classics. ‘White Knight Big City’ also came across well and was introduced as a tribute to the legendary Bay area equality activist Harvey Milk. Steph and Chuck. Not taken at gig. However the evening wasn’t just about the newer material as Chuck delved into almost half a dozen of his past albums to deliver classics such as ‘Summertime Thing’ from NO OTHER LOVE, even further back to 1997 for ‘Credit’ from HOMEMADE BLOOD and the exceptional ‘You Did’ with the demanded audience participation. This crowd pleaser closed the main set by which time there was no stopping the momentum of Chuck with his outstanding guitar playing, wry humour and charismatic front of band persona. The stage presence was increased when Chuck called up a guy from Birmingham Americana/indie band Gas Food Lodging to sing backing vocals on this pre-encore number. At this stage it seems appropriate to introduce the current line up serving the Mission Express. In true rock n’ roll tradition, dramatic introductions led us to meet Vicente Rodriguez from San Antonio, Texas on drums, Kevin White on bass from Massachusetts and multi guitarist James Deparado, a fellow Californian of Chuck, on lead. Last but not least the force behind Chuck was revealed to be keyboard player and long time partner Stephanie Finch who showed her versatile talent by stepping forward to play acoustic guitar and singing ‘All is Forgiven’. An almost country moment amongst the relentless but thrilling onslaught of pure Americana rock n’ roll. Stephie, as she is known, then remained up front to sing a duet of ‘Castro Halloween’ whilst sharing Chuck’s more conventional of the two mics used during the evening. The other was periodically used for a dramatic loud haler echo effect. It goes without saying that the band was superb and gave Chuck the support he needed to bring out the live true quality of his songs. The evening had got off to an impressive start with a brilliant support slot from Oxford based Americana/indie outfit The Dreaming Spires who used their half hour set to showcase several songs from their fabulous debut album BROTHERS IN BROOKLYN. Of these, the standout from my point of view is their observations on Californian Classic Gold Radio in ‘Not Every Song from the Sixties is a Classic’, while their self penned ‘Singing Sin City’ saw the Flying Burritos majestic song of almost the same name sampled alongside it. 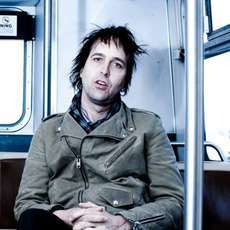 To prepare us for Chuck Prophet, the band spearheaded by the Bennett brothers, Joe and Robin, also played their version of his song ‘No Other Love’. The Dreaming Spires are definitely a band to look out for and are likely to be featured here more prominently in the future. So the wait for many to catch Chuck Prophet live in Birmingham was over and a special word of thanks must go to Nottingham based promoters Cosmic American who hosted this brave venture 50 miles down the M42. For those just getting into Chuck, the statement has to be said better late than never. However as a baseball and Americana fan, the ultimate memory is of Chuck singing the immortal line ‘three on, two out, under lights’ as well as having the satisfaction of knowing who Willie Mays is.